This list is not all-inclusive nor meant to serve as an endorsement. Where only state depart­ments of agriculture are listed, be prepared to receive limited assistance. 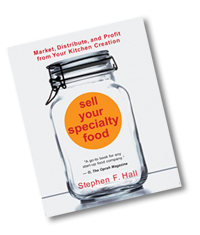 Most such departments are devoted to commodity marketing, not retail-packaged, high value food prod­ucts. In those instances where no state association is listed, you may wish to consult a listing of state departments of agriculture.These listings have been identified as helping people start a food business. Every state has a department of commerce and business development, usually located at the state capital. Its sole purpose is to promote and develop business within the state and offer new businesses information on state regula­tions and any legal requirements that apply. The book includes listings of glass manu­facturers, box manufacturers, basket com­panies, packaging and bag businesses, printers, label designers, co-packers, truck­ers, food technologists, public relations agencies, etc. Flavors of Arizona is an organization composed of Arizona food manufacturers. The Sonoran Desert is an incubator for creative food products ranging from Sonoran grown pecans and prickly pear cactus products. This association has published a directory of resources essential to food producers. The book includes listings of glass manufacturers, box manufacturers, basket companies, packaging and bag businesses, printers, label designers, co-packers, truckers, food technologists, public relations agencies, etc. This association has created Connecticut Food Trail, an online, direct access venue showcase Connecticutt specialty food brands. The association supports and strengthens spe­cialty producers to enhance the Massachusetts economy and promotes the interest of food producers and processors in the state. It serves as an umbrella organization to assist its members in obtaining financial, scientific, man­agement, marketing and technical assistance. The association has access to consultation in many fields, including research and develop­ment, business and financial management, mar­keting, and technical and scientific areas. Dartmouth (MA) Grange Shared-Use Kitchen A state certified commercial state-of-the-art kitchen with all the amenities that a specialty food producer, grower or caterer might need, including: A 40-gallon tilting skillet; a 40-gallon steam-jacketed kettle; 2 convection ovens; a 6-burner range with two conventional ovens; a 20 and 40-quart stand mixer with grinding attachment; an automated filling machine; a 4-quart commercial food processor; an industrial stick blender; digital scales; assorted small wares. A producer-consumer service and regulatory department under the New Mexico State University (NMSU) Board of Regents. Its Marketing and Development Division assists in the development of new markets and expansion of existing markets, both domes­tic and international, for farm products and livestock produced or processed in the state. It also assists commodity commissions in organizing and implementing commodity promotions. Texas Department of Agriculture P.O. Box 12847 Austin, TX 78711 800-835-5832 512-463-7476; Fax: 888-835-5832 email: SDUNN@AGR.STATE.TX.US; Website: agr.state.tx.us This agency has access to a large database called Texas Agriculture Marketing Exchange (TAME). Ask for a copy of the very thorough Vermont Specialty Food Resource Directory. This organization if part of the state effort of the Economic Development Council of Northern Vermont.